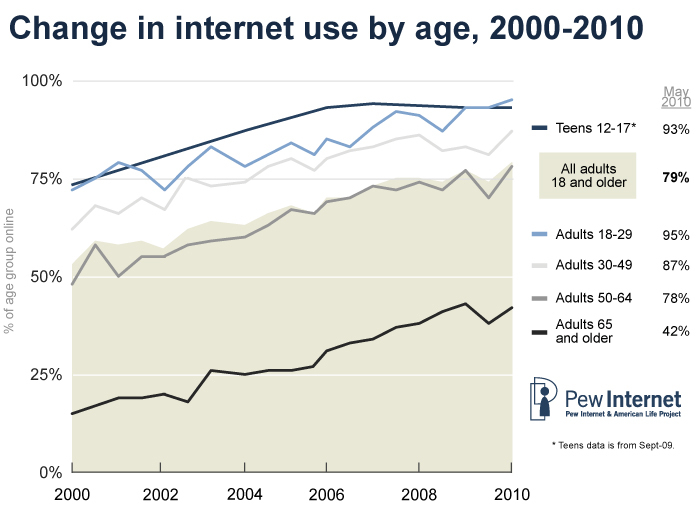 The majority of U.S. adults have internet access, including those who are living with chronic disease. 62% of adults living with one or more chronic disease go online. It is important to note that 80% of adults who provide care to their parents or another loved one have internet access. So while internet access is unevenly distributed, especially among age groups, many people have “second degree” access. 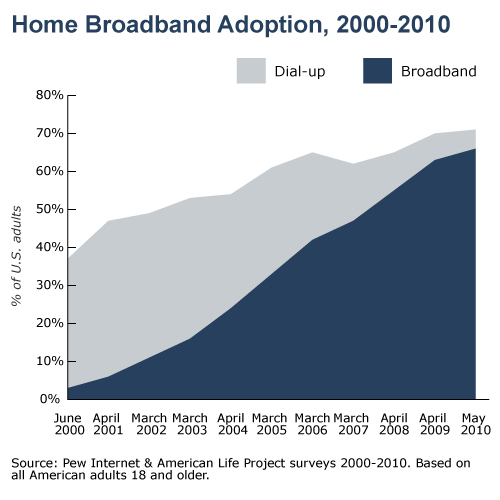 Broadband changed us as internet users; mobile is the new game-changer. Cancer patients are likely to be engaged in their care. Pew Internet’s research adds to this picture of an activated patient population by showing that the internet, particularly social media, enables people to engage with each other and with health care in ways that were almost unimaginable a decade ago. People learn from each other, not just from institutions and health professionals. An upcoming report from the Pew Internet Project and the California HealthCare Foundation shows, however, that people turn to health professionals for some types of information and to fellow patients, family, and friends for other types. Professionals, such as doctors and nurses, are the most likely source for people who want to get an accurate medical diagnosis, information about alternative treatments, a recommendation for a doctor or specialist, and a recommendation for a hospital or other medical facility. Peers, such as fellow patients, family, and friends, are the most likely source for people who want emotional support in dealing with a health issue or a quick remedy for an everyday health issue. When it comes to practical advice for coping with day-to-day health situations, people are as likely to turn to peers as they are to turn to professionals. Most of these conversations happen offline, but the upcoming report also shows that about one in five internet users has gone online to find others who might have health concerns similar to theirs. The internet connects people across geographical boundaries, which is especially important for people living with rare cancers. Eight in ten internet users go online to look for health information, no matter their health status. Searching online for certain topics is almost universally popular: specific disease information, treatment options, and prescription drug information, for example. Social network sites are important information hubs for many Americans, including a growing group of older adults.6 The internet is not just an information vending machine. It is a social, mobile communications device that can fit in someone’s pocket, helping them wherever they are to connect with just-in-time information and support. Interestingly, there are two online activities which stand out among people living with chronic disease: blogging and online health discussions. When other demographic factors are held constant, having a chronic disease significantly increases an internet user’s likelihood to say they work on a blog or contribute to an online discussion, a listserv, or other online group forum that helps people with personal issues or health problems. Living with chronic disease is also associated, once someone is online, with a greater likelihood to access user-generated health content such as blog posts, hospital reviews, doctor reviews, and podcasts. These resources allow an internet user to dive deeply into a health topic, using the internet as a communications tool, not simply an information vending machine. The online conversation cannot be controlled, but trusted sources can contribute by making it easy for internet users to find and share up-to-date information. For example, instead of publishing only in PDF, organizations can publish in a way that allows someone to grab a chart, a data point, or an image and link back to specific part of a document. Publicly-available data sets can also be posted in computable formats. The internet is like a secret weapon – if someone has access to it. And yet, those who are online have a trump card. They have each other. Pew Internet’s research finds that having a chronic disease increases the probability that an internet user will share what they know and learn from their peers. They unearth nuggets of information. They blog. They participate in online discussions. And they just keep going. Broadband + mobile + chronic disease = our future. Broadband and mobile internet access is spreading to more Americans, making them more likely to access health information whenever and wherever they need it. The always-on, always-with-you internet enhances people’s online experience and creates a positive feedback loop, reinforcing their interest in using the internet to gather and share information. Two waves are crashing together – an increase in technology and an increase in chronic disease – and both are driving us forward toward engagement in online health resources.